For many, the weekend after Thanksgiving is a time for recovery. Some have to purge from the gluttony they enjoyed the Thursday prior. Others recover by bringing family to the airport to send them far and away. For runners along the Mississippi Gulf Coast, the recovery needed doesn't start until mid-day Saturday. That's when the Mississippi Gulf Coast Marathon, Half Marathon and 5K have concluded. For the fifth consecutive year, I scheduled this race on my running calendar as a must-do event. In years past, I've liked the small town feel of the event located on the grounds of Stennis Space Center less than an hour from New Orleans. My race morning routine was a little off-kilter for the Mississippi Gulf Coast Marathon this year. I went to bed early on Friday evening, but tossed and turned until after midnight. Waking up on Saturday morning to give myself enough time to get to the race wasn't easy, but I did. Even after waking, I was still reluctant to get ready and to get in my car. Nevertheless, I did end up arriving at Stennis Space Center, completed race form and cash in hand. Multiple texts to Katherine, Anne, and Karen (all good friends and fellow runners) were made in attempt to get motivation to register and start the race. They are what I'd like to consider the angel and devil that sit on each of my shoulders, with another being the solid voice of reason in the middle (they can duke it out to decide which is which). All three finally convinced me to at least run the half since I had driven to the race site and parked. Solid reasoning on their part, and my texts were not in vain. 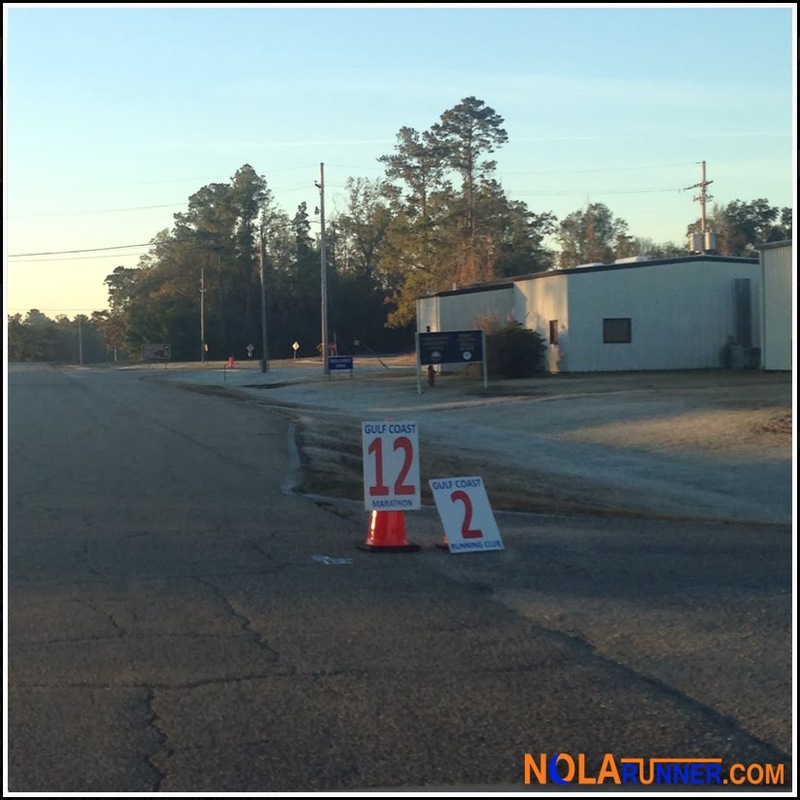 The Mississippi Gulf Coast Marathon is a smaller race, with cotton long sleeved shirts, minimal amenities, and little need for course security and street closures. As a result, it is super cheap by marathon registration standards. Fees for the full on race morning were $40, with the half costing $30. I registered for the full, knowing that the $10 investment would allow me to make the decision late in the half as to whether or not I wanted to run an additional 13.1 miles. An extra Alexander Hamilton is a small price to pay for me to have options. Another great thing about this small race is the laid back atmosphere at the start. The 5K, half and full marathons all start together. The race director, clad in his running attire, gives pre-race instructions on a bullhorn and falls in to the crowd to run the race himself. I started towards the back of the pack, and peeled off as I passed the parking lot to throw my sweatshirt in my car. Convenient, if not tempting to jump behind the wheel and drive off. The course for the race is what I like to refer to as a "modified double loop." Runners leave the start line for a one mile stretch, with half and full marathoners turning right at the one mile marker to embark on a 12 mile loop. 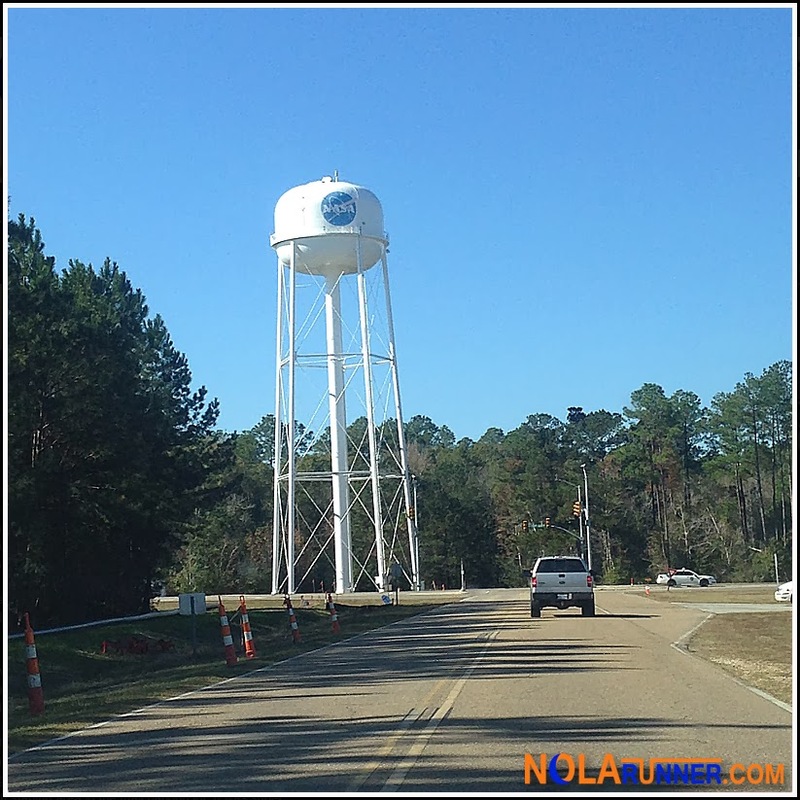 This loop is on the scenic streets of the active Naval Base that is Stennis Space Center. The loop has well manned aid stations supplied with water, Gatorade, hard candy, bananas, and Vaseline every two miles. At mile 9, a local running store supplies carb supplements. I grabbed a Hammer Gel flavored Apple Cinnamon, which tasted just like apple pie filling. Probably the best Guu I've ever tasted. I took the first half slow, pacing as if I were going to run the full. I knew I wanted to run 26.2, but also knew that I am planning on running a full this coming weekend in Baton Rouge, plus a half in NOLA the weekend after. With those goal races on the horizon, I didn't want to injure myself or burn out on the first of three consecutive race weekends. Around mile 7, a hot spot formed on my inner right thigh from chaffing. This may be TMI, but its imperative to know that this is when I decided it would be best to pull the trigger and complete the half. I have a high threshold for pain, but when it comes to chaffing, I'm out. Fortunately, there was an aide station nearby and I reapplied Vaseline to help ease the burn. When the 1 & 12 mile markers were back in my sights, I started to contemplate doing the second loop of the race. I even made the turn to embark on a second go around. Literally at 5 steps in to a second lap, I turned around and decided once and for all to finish the race. Crossing the finish line of this race for the first time as a half runner was different, as my previous four participations were all full finishes. There were more spectators at the finish line, a lot more activity at the post-race party, and copious amounts of hot pastalaya, soda and beer for participants. There's not much to say in regards to changes to the race and its organization. 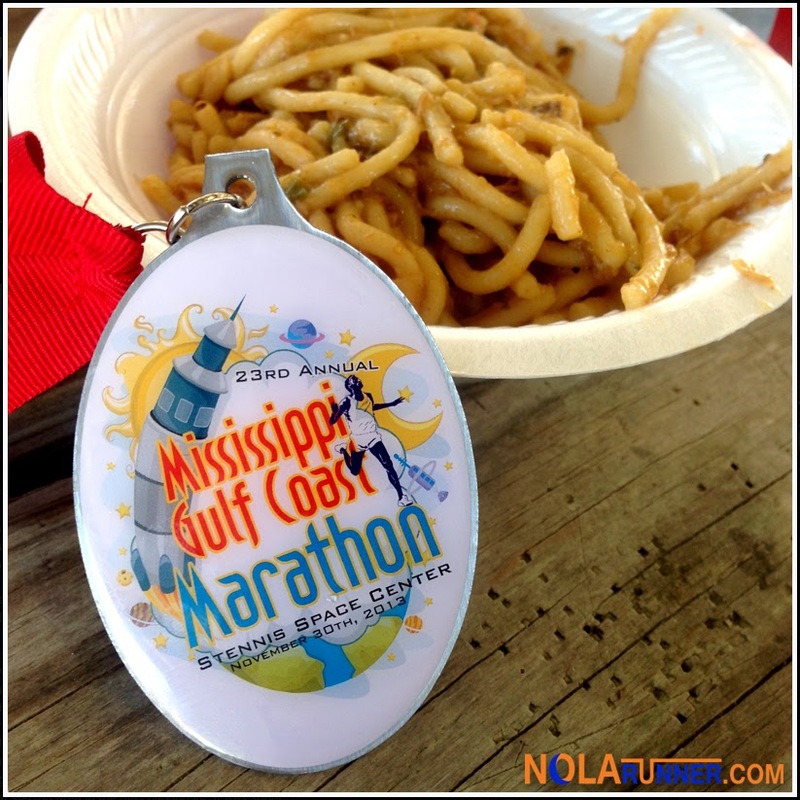 The Gulf Coast Running Club has hosted the event for 23 years, and it takes place on a well maintained and secure course. Aid stations are adequate and fully stocked, and the needs of runners are well taken care of. If I were to nitpick, however, I would suggest separating the 5K race from the half and full. Starting the 5K 15 minutes after the longer races would allow it to be done before the half leaders finish, and cause less congestion at the start. Also, the medals are intended for full marathoners only. Half finishers receive leftover medals from previous years until they run out, which can be a disappointment for some. I was lucky to be handed a medal for this year's race as I crossed the finish line of the half. It was an unexpected surprise, but I'm happy to be able to add this colorful piece to my collection. Finally, with chip timing technology being as pervasive as it is, the antiquated system of tear off bib tabs for timing could be replaced. However, using this system saves money and is kind of endearing to see at the race. In the end, I'm glad I decided to run the half marathon at the Mississippi Gulf Coast Marathon event. It is a great event put on by a great organization. I've said it before and I'll say it again, these "small town" races are sometimes needed to put all those other big races in to perspective. While I wouldn't necessarily recommend it for someone who is completing their first half or full (two to five hours with no crowd support is hard even for the most seasoned runner), an athlete with several races under their belt could thoroughly enjoy this event. Check out the official race results HERE, and LIKE the NOLArunner Facebook page for more photos from the race HERE.